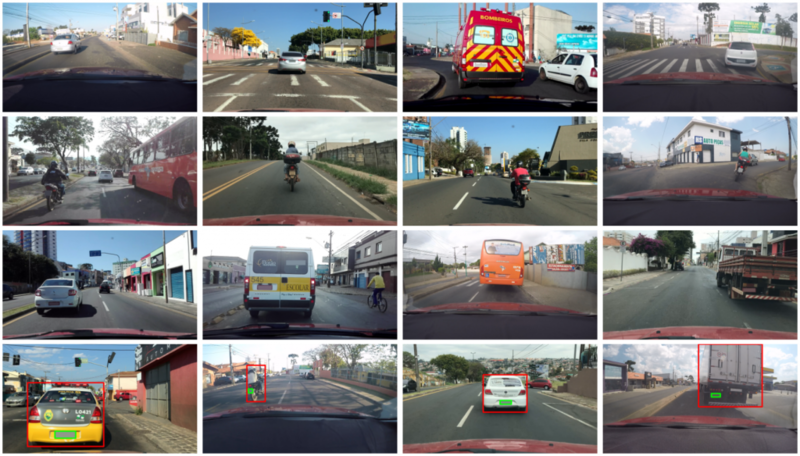 This dataset, called UFPR-ALPR dataset, includes 4,500 fully annotated images (over 30,000 LP characters) from 150 vehicles in real-world scenarios where both vehicle and camera (inside another vehicle) are moving. It has been introduced in our IJCNN paper [PDF]. The images were acquired with three different cameras and are available in the Portable Network Graphics (PNG) format with size of 1,920 × 1,080 pixels. The cameras used were: GoPro Hero4 Silver, Huawei P9 Lite and iPhone 7 Plus. 300 of motorcycles with gray LP. The dataset is split as follows: 40% for training, 40% for testing and 20% for validation. Every image has the following annotations available in a text file: the camera in which the image was taken, the vehicle’s position and information such as type (car or motorcycle), manufacturer, model and year; the identification and position of the LP, as well as the position of its characters. The full details are in our paper. The UFPR-ALPR dataset is released for academic research only and is free to researchers from educational or research institutes for non-commercial purposes. Please click here for more info about obtaining the dataset. Please contact Rayson Laroca (rblsantos@inf.ufpr.br) with questions or comments.